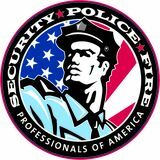 SPFPA: Advancing the Welfare and Interests of Members SPFPA functions as the largest, oldest and most prominent International Union for security police professionals in the country. Considered the â&#x20AC;&#x153;Authority of Security Unionsâ&#x20AC;? in the United States and North America, the Union represents more than 27,000 professionals working in the public and private sectors, including such organizations as military installations, nuclear facilities, airports, seaports, homeland security facilities, government buildings at every level, and more. Previous post: SPFPA: What Sets Us Apart? 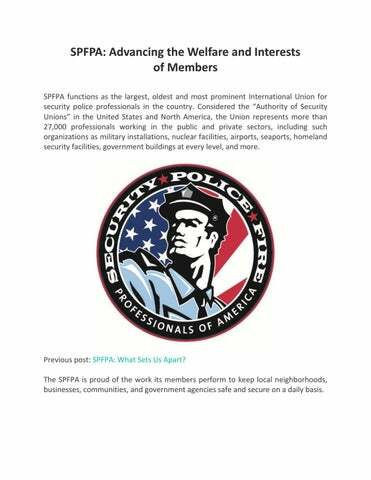 The SPFPA is proud of the work its members perform to keep local neighborhoods, businesses, communities, and government agencies safe and secure on a daily basis. In turn, the Union recognizes the need to protect those who protect and serve throughout the U.S.â&#x20AC;&#x201D;something the Union strives to accomplish through education, legislation, litigation, and collective bargaining. Headquartered in Roseville, Michigan and comprised of 200 local chapters across the country, the SPFPA is committed to ensuring job safety and stability for every member.